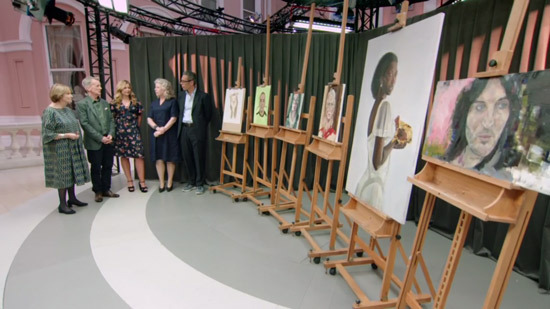 This a REVIEW of the second episode of the new series of Portrait Artist of the Year 2018 - of the second heat, held at the Wallace Collection last April - aired on Tuesday night. Anybody who has not yet watched and doesn't want to know who won should exit right now! I am of course now watching care of my new NOW TV app! 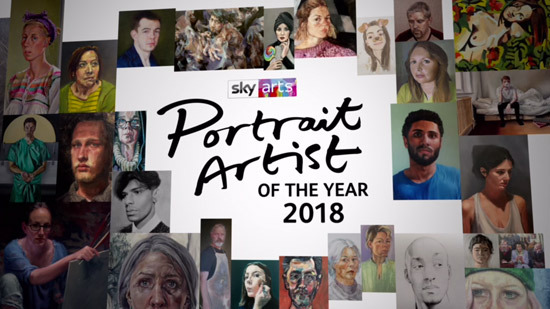 (see How to watch Sky Arts - Portrait Artist of the Year 2018 without subscribing to Sky! Philip Mackey (Facebook Page) - from Letterkenny, Co Donegal. He is currently employed by the Office of the Chief Herald as an heraldic artist and calligrapher based in the National Library, Kildare Street, Dublin. Michelle Opuku Taylor - Her self-portrait showed her after her mastectomy holding her breast in her hand - a very powerful painting - and a good likeness. She had graduated in law and was teaching but decided to make painting her full-time career after her treatment. Daniel Yeomans - born in Bedford 1986. 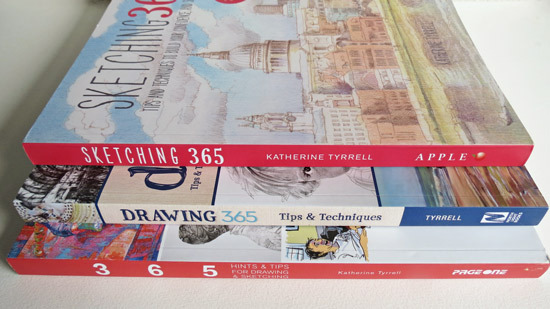 Studied art, design and media at college and subsequently chose to study at the Charles H. Cecil Studios in Florence, where he trained using a technique known as ‘sight-size’. He usually paints directly from life under natural light in his purpose built studio (a converted cowshed) in Montgomeryshire. Danielle Vaughan (Facebook Page) - a recycling artist who works in ripped paper on cardboard. She trained as a Shoe Designer at De Montfort University, then after a post-graduate certificate in education became a teacher for six years then home-schooled her own children for seventeen years. Became a professional artist two years ago and currently working on a series of works about the people and places of Leicester. Andrew Kelly - grew up in Ayrshire and inspired by Peter Howson according to his Saatchi website. Now a government lawyer who paints at weekends. 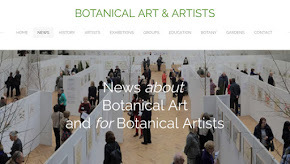 Exhibited at the 70th Annual Open Exhibition of the Chelsea Art Society 2017. I have a new theory that judges start off with pre-conceptions about an artist based on how well the artist has managed to capture their own likeness. I particularly liked Philip Mackey's gouache self portrait of himself painting himself as if a 3D sculpture - but also showed how well he could paint himself from different angles! The analysis of the self portraits by the judges was again impressive. 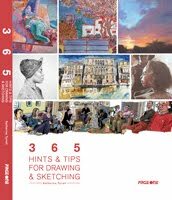 Lots of learning points for those who aspire to paint good portraits. 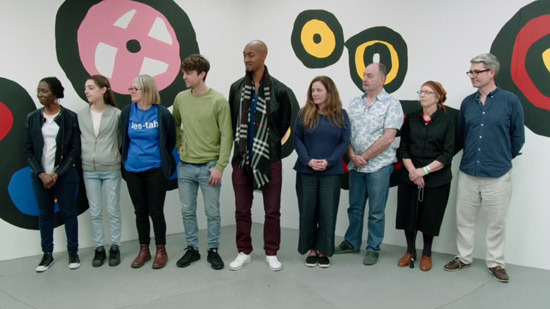 The sitters for Heat 2 were Comedian Noel Fielding, TV presenter Reggie Yates and model Daphne Selfe. I'm reminded of another reason why artists use iPads in this competition. Some of the sitters are more accomplished at sitting still than others and it's entirely pot luck who you get. Reggie and Daphne were very impressive - they didn't seem, to move at all. Whereas Noel was a bit of a fidget! It was so sad to see people who produced excellent drawings to underpin their paintings - only to lose them when they started to paint. 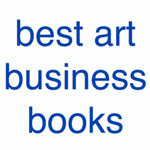 However it's obvious that the judges pay a lot of regard to drawing. 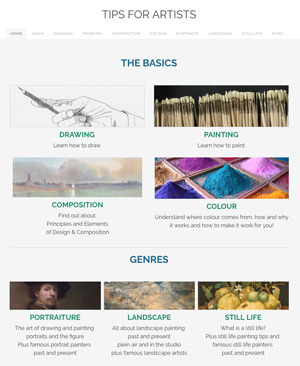 I prefer the ad hoc discussion of interesting points re approaches to portraiture and artistic practice which pop up throughout the programme. They keep my attention. I really enjoyed Noel Field's summary of the artist behaviour towards the end! He had a set of three who seemed to spend an awful lot of their time looking at their iPads rather than at him! It's evident that some of the self-portraits are the product of many hours work. 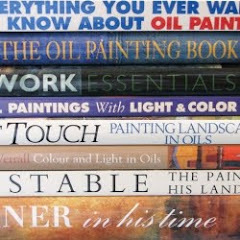 Where skills in draughtsmanship and painting are lost in the heat, it must undermine the assessment of the artist i.e. people tend to judge you on the weakest work when there is a significant gap rather than the strongest. 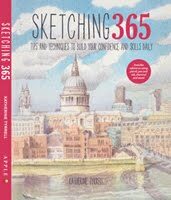 One artist (Ashley) was tempted to start over - but also recognised how much of a challenge she would make for herself if she did. Not a lot of discussion of backgrounds, but in my opinion if you leave the background to the end you can be very surprised when you add it in and then watch how it changes the overall colour palette and tonal values of the painting. There were paintings where I wanted to shout "just block in a background properly". There were some very curious placements and crops. I think people sometimes forget to allow what will happen to a work when framed. ... to the point some were overworked. 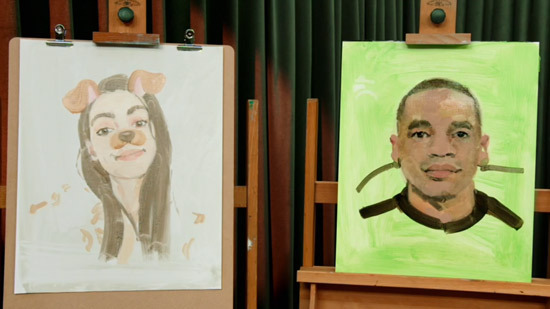 After four hours the artists chose which portrait they wanted to keep. Noel Fielding had, in my opinion a very difficult choice - they were all good. He chose the giant collage by Danielle Vaughan and my guess this may have been dictated by it being the one he would feel most comfortable about hanging on his wall. Reggie Yates had a different sort of problem. I don't think any of the artists had quite caught his likeness although all had done reasonably well. He chose the painting by the professional painter Daniel - and said it was the painting which would represent him for years to come. Daphne Self chose the portrait by Leanne Mullen. She was impressed with the minimal painting of the earrings. The Judges then had to sort out the shortlist of three - and discussed each of the portraits in turn. They observed that a number of the paintings lost something between early/middle stages and the final portrait. Different portraits had different reasons - and those wanting to enter will do well to listen to some of the points made as they seemed that a number are the sort that are perennial issues e.g. over-working. ...and then the final heat winner - based on both the self-portrait sent with the entry to the competition and the portrait produced in the heat. Ashley Kitchen - Kathleen Soriano was very taken with the eyes. Frank Skinner noted that they both seemed to be 'happy' paintings. Michelle Opuku Taylor - the judges praised the fact she caught Noel just as he looked at something. 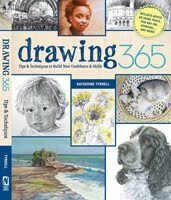 Leanne Mullen - who attracted a lot of praise for her acute observation and her wonderful sculptural drawing and her knowledge and understanding of painting. Below are their self portraits on the left and their heat paintings on the right. See if you can spot who won before I tell you. A photograph of Ashley's work does not reveal the quality of her brushwork or the way she achieves a lot in a quite sophisticated way using only a little paint. I liked the difference between her turpsy washes and the more opaque passages. The eyes were brilliant! I'm not sure why she chose this format for the canvas. It's a very nicely painted portrait - but the decision to use pink on the left just draws the eye for me and almost makes his face sink in the competition with the black. This was one for me where getting the background in earlier would have allowed more time to work the whole. This painting for me started well and continued to go well - for the most part - and you could see from the self-portrait where it might end up. For me the two together demonstrated the most consistency of purpose and approach. Leanne Mullen won the heat - and in my opinion it was a very well deserved win. Her painting had looked like a winner from the off. That makes her the second Irish female artist to make it through to the semi-finals. The judges really appreciated how she 'built' the portrait . They felt the other two held a lot of promise and would want to see how they progress in future - but felt now was not their time. 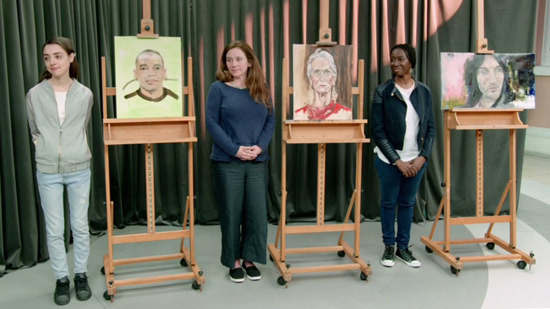 Exclusive Interview With Heat 2 Winner Of Sky Arts Portrait Artist Of The Year | Cass Arts - in which you can see some drawings Leanne did of Daphne Self when they met up again in Belfast last summer. 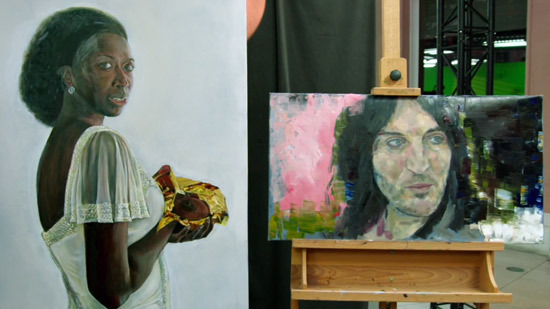 How to watch Sky Arts - Portrait Artist of the Year 2018 without subscribing to Sky! I enjoyed this article as much as I enjoyed the programme; you got it exactly right with the links to the artists pages being the icing on the cake. Many thanks. 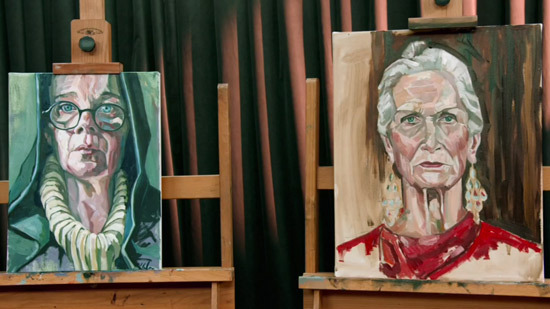 I’ve watched all the series of the Portrait competition and felt personally the enormous pressure on the artists. 2. Cameras on your shoulders! 3. The public making comments within hearing. (its strange how people don’t consider that you can hear them!! same experience when painting en plein air). 4.The unusual lighting both sunlight and masses of spot lights. 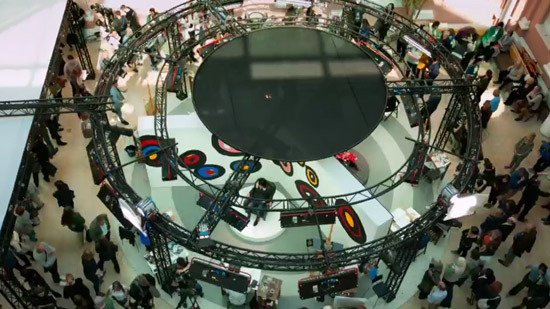 5.And in some cases unfitting backgrounds! 6.A sitter who doesn’t sit still for a minute. 7. Not even knowing who your sitter will be. 8. No choice of where to stand. Some have been really challenged when stuck on the end. I have been painting portraits professionally since the 1980’s and each one is in a situation that I am in control of - lighting both low and spotlights, comfortable seating, background (based on the sitter and their aura). I have completed portraits in less than 2 hours demonstrating to art groups and produced a good likeness - and also taken a month or more to complete official portraits which require complicated surroundings and backgrounds. Its still a compelling programme to watch. Who do you think will win? Thank you for this blog, a lot of work but appreciated. 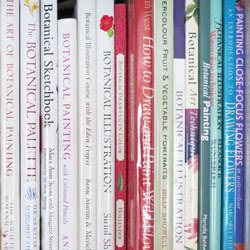 Hi, quick question, do you the name/type of easel they use in this series? If by name you mean brand, no I don't. Gender bias in Government Art Collection?